Based on the published curves of the filters above, the Baader UV-IR filter blocks wavelengths above 700nm and the HOYA R72 infrared filter blocks wavelengths below 700nm, so with both filters in the optical train, no light (or very little) should be reaching the 450D's imaging chip. When I first tested the modified 450D with the HOYA R72 filter I was surprised to see the amount of infrared light that was captured and this is still puzzling to me. 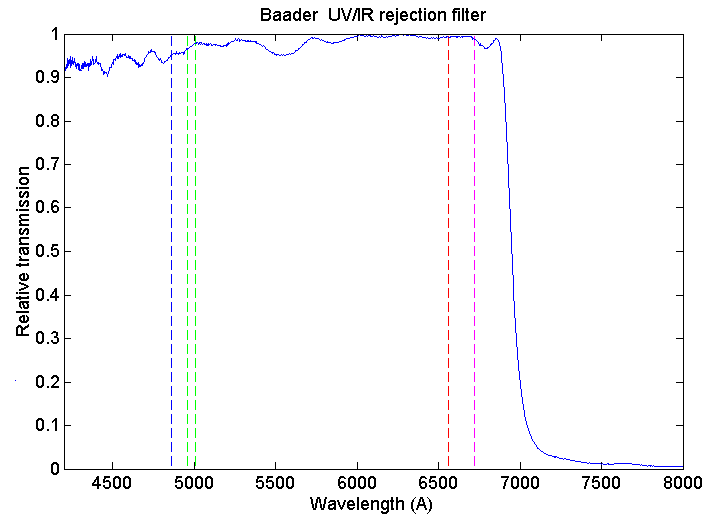 One thought is that the 450D's CMOS imaging chip is sensitive to wavelengths greater than 1100nm where the Baader UV-IR cut filter begins to pass light again as can be seen on the following transittance curve published for the filter by Baader? In the photos below, an X-Nite CC1 color correcting filter was used for the normal image and the Hoya R72 filter was used in its place for the infrared image. Focusing through the camera's viewfinder when using the R72 filter is not possible because it is a very dark red, nearly black, filter. Fortunately, the 450D has a "live view focusing" feature by which the camera displays the actual image being recorded on the imaging chip. For outdoor daylight imaging in moderate light with the HOYA R72, the "live view focusing" camera display gives an easily seen infrared image for focusing, even using the 5X and 10X modes. Normal: ISO 200, F10, 1/200 second, 55mm, AWB and Auto focus. Infrared: ISO 400, F5.6, 1/8 second, 55mm, AWB and Auto focus. Normal: ISO 200, F9.0, 1/200 second, 18mm, AWB and Manual focus using live-view. Infrared: ISO 400, F4.5, 1/10 second, 18mm, AWB and Manual focus using live-view. Based on the results above, I suspected that the DSLR version of the Baader UV-IR filter may not have the same filtering characteristices of the versions sold in 1.25" and 2" cells for astrophotography. So I held a "Baader IR Blocking Filter 2" (optically polished APS-coated #2459210)" in front of the HOYA R72 infrared filter and it blocked out more infrared light as shown below. I don't know if stacking two IR cut filters would decrease the infrared light to this degree; or maybe the DSLR version of the filter is just weaker than published curves. Camera Settings: ISO 400, F5.6, 1/10 second, 18mm, AWB and Manual focus using live-view.